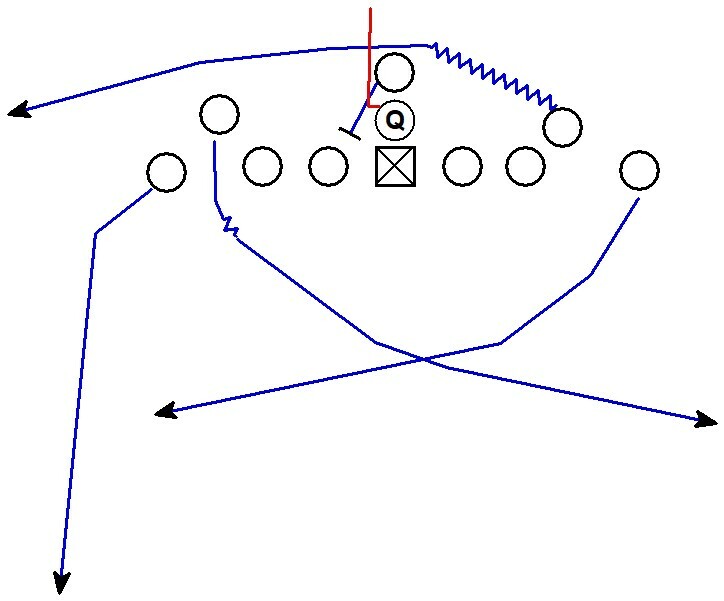 Troy presents a front spacing with a 3 technique to the boundary and a shade nose to the field. 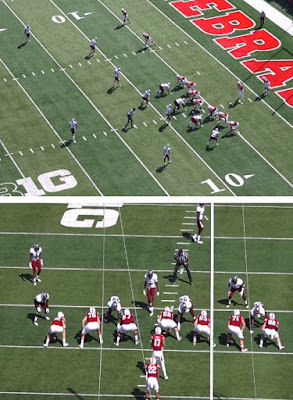 The anticipated defense would send the boundary OLB in the charge and the front would fit like a 4-2 box. Post snap the Troy defense resets the front by pressuring the Mike backer. The boundary OLB (Jack) is actually part of the coverage. 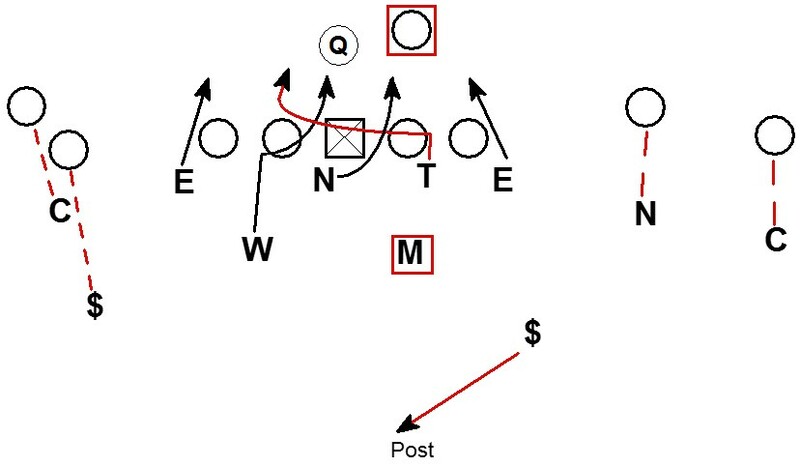 The combination of the DL slant and Mike pressure changes the front post-snap to fit like a 4-3 with the 3 technique aligned to the field. 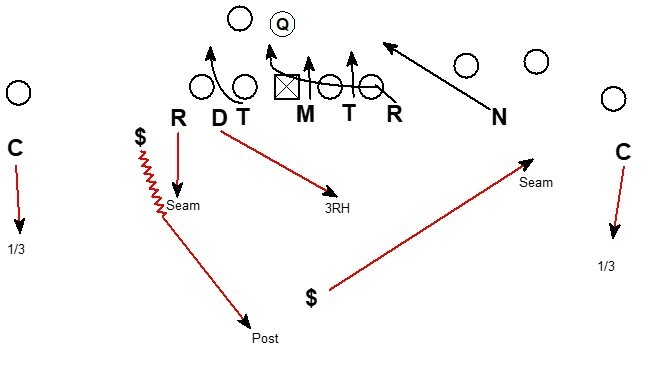 The blitzing Mike serves the role of "3 technique" while the down Safety, Will, and Jack fill the roles of the 3 "LB's"
The offense was running a pin & pull scheme which is set up with good angles against the initial defensive alignment. Post-snap the offense struggles with the pressure. The Nose does a great job redirecting on the slant with the block back pull of the G/C. 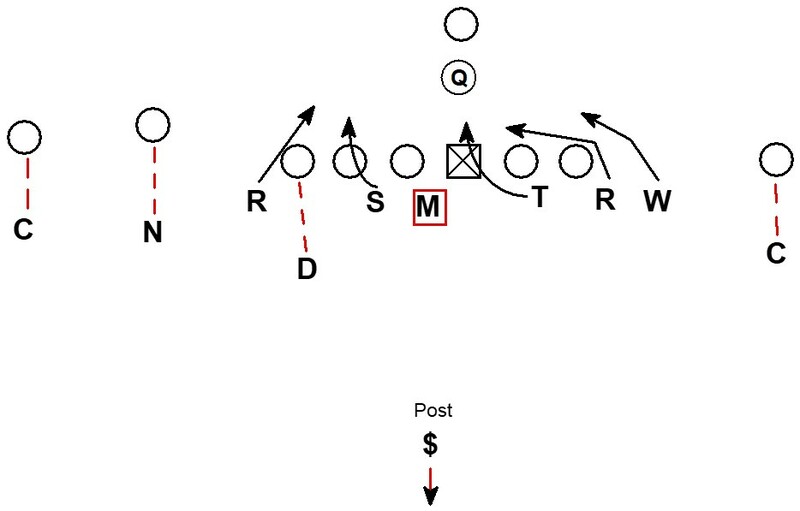 The Mike on the pressure dents the run in the backfield with penetration. The Mike (outside) and the Will (inside) can vise the pull of the center. 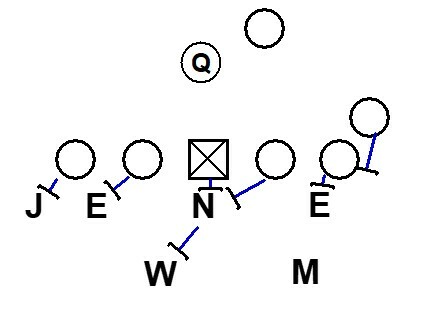 The play side DE also does a great job of crossing the TE's face on the block back pull. 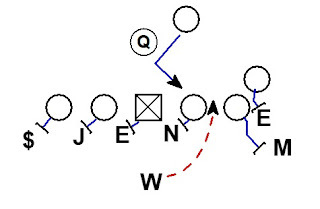 The Safety (outside) and DE (inside) are able to vise the pull of the OT. Good stuff from Vic Koenning and the Trojan defense. 2017 Florida State is in an X backer personnel with a sub secondary on 3rd & 8. 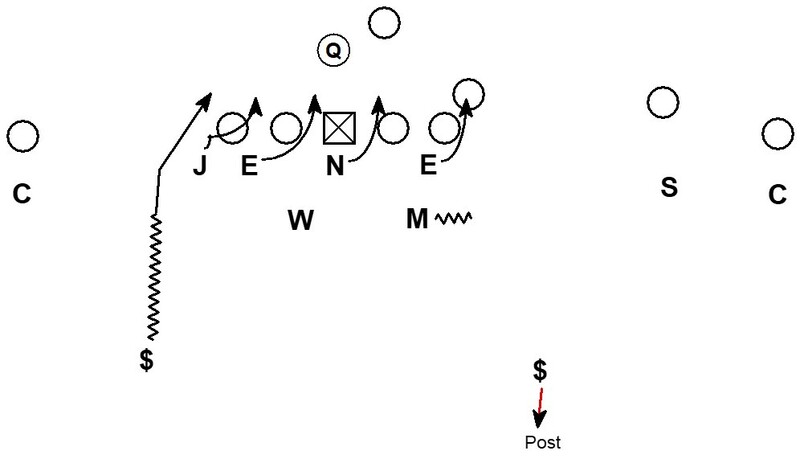 The Ends are contain with the X and Nose executing an interior pass rush twist game. The Nose jabs away which helps create space for the X backer. The X backer uses the space to get the guard to engage and commit. When the Nose wraps the Guard has a hard time redirecting to pick up the twist. 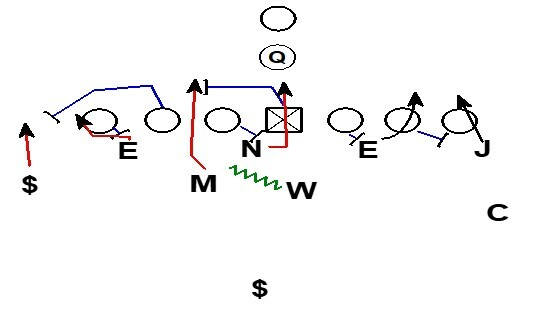 Cover 1 with safeties in the hole and post. 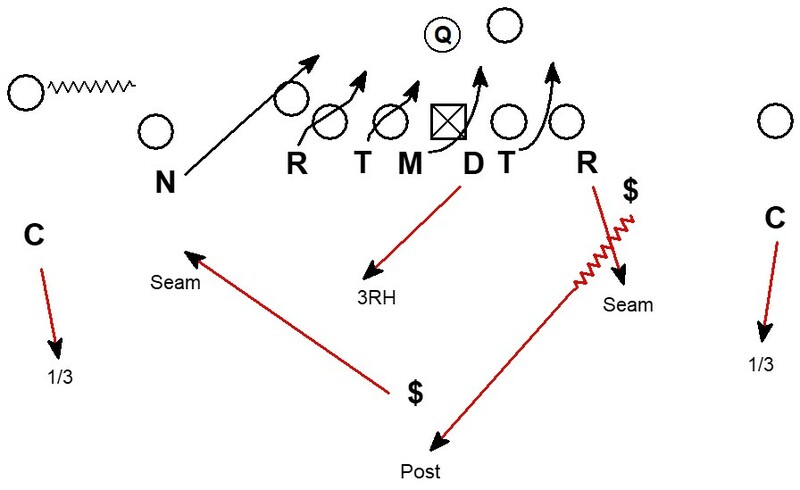 The sub personnel allows for the defense to match all the speed receivers with DB's. The Mike in this situation is a 7th DB, in this case a big safety body. The Seminoles built a nice situational pass rush package. The 7 DB's allow the coverage to match-up against the speed Syracuse has on the field. 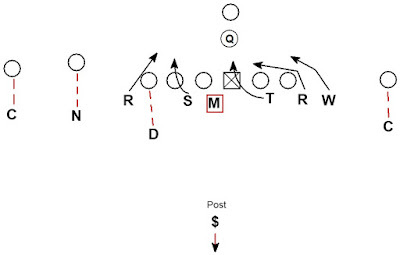 The X backer allows a versatile pass rusher to get involved in the interior pass rush. The stunt is not new but FSU does a good job of utilizing personnel to get the right people on the field doing what they do best and executing the call at a high level. This pressure is from the 2017 UCF defense. The DL is slanting from a 4i-0-4i alignment away from the edge rushing safety. 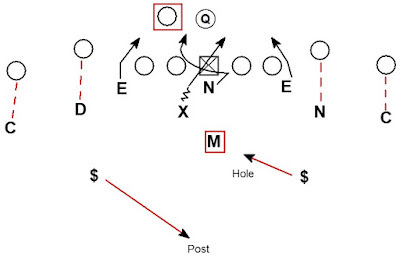 The box is initially a 6 man box but the blitzing safety changes the math to a 7 man box. Cover 1. 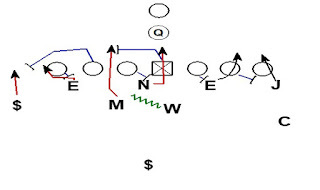 Although it is possibly an aggressive version of 3 deep 3 under firezone with pressed corners. 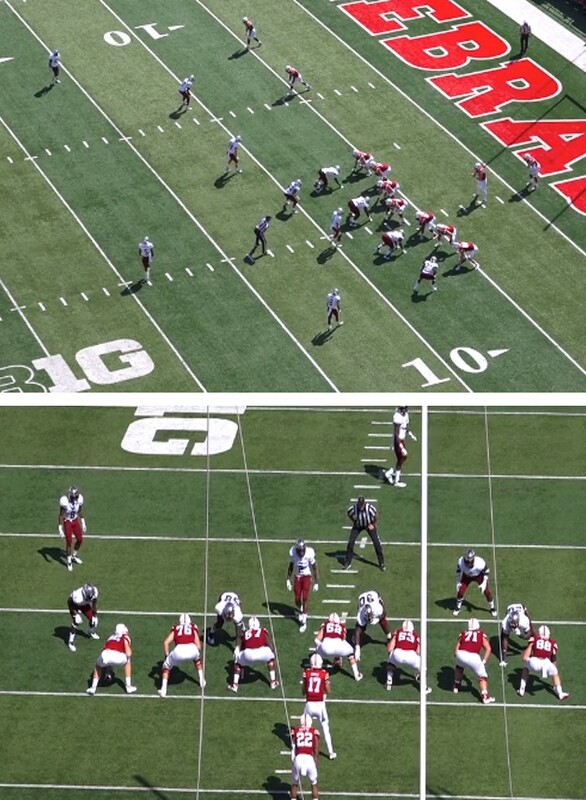 The box picture for the OL pre-snap is a fairly standard 4-2 look with both ILB's in the box. Play side the OT and OG are fanning out to the Jack and End. Back side the C&OG are zoning to the Will while the back side OT&Y are zoning for the Mike. By the time the Safety rolls down to blitz and the Mike bumps out of the box the OL blocking is declared. The final picture looks more like a 4-3 defense with the Safety & 2 ILB's combined with the slanting DL to space like a 4-3 box. Because of the initial picture the OG is aggressive to the slanting End and quick to travel back inside. The OT sees the blitzing safety and adjusts but the OG is gone leaving the Jack unblocked. Even if the zone blocking had stayed intact the play is outnumbered by the defense and the zone would break in a different place. The 4i on an outside move is a problem for the zone. 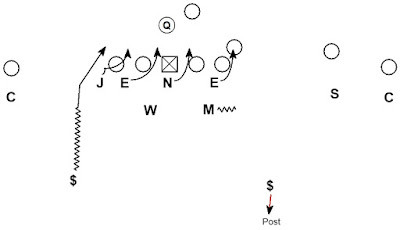 Once the back side OT and Y started comboing for the End and Mike the Zone has a challenge. The OT travels back with the End and eventually works to the Mike. 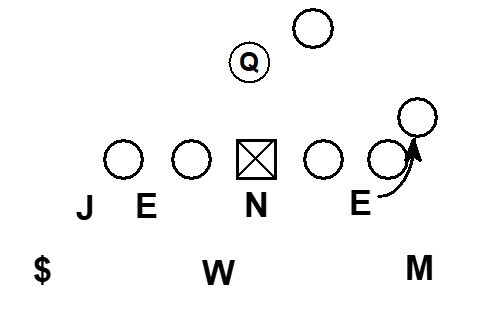 In the last diagram shows what if the OL zone blocks the pressure accounting for the blitzer and slanting DL. Even if that all happened the zone would still have broken. 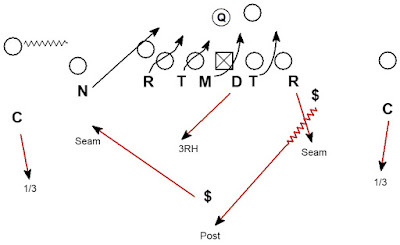 The zone cannot account for the scraping Will backer when the RB cuts back. The slanting End and Mike do a nice job of building a wall back side to force any cutback into the rush. Another option would have been for the combo's to remain as originally declared. The zone is still outnumbered. 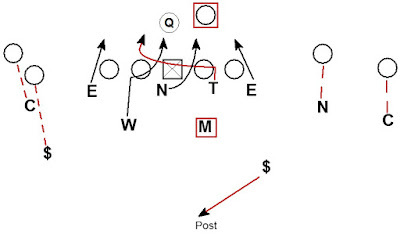 If the OT & OG travel back with the Jack and End as they slant the Center & Guard combo works to the Nose & scraping will the safety blitzing is unblocked. 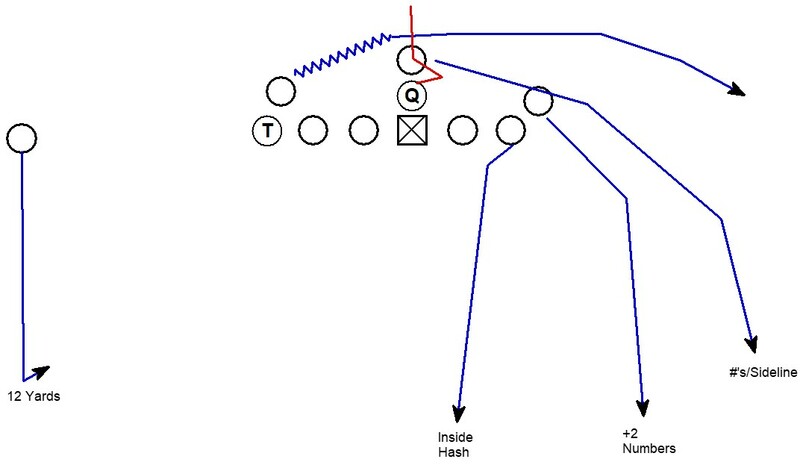 The two most likely outcomes are the safety makes the play in the backfield or the run cuts into a wall backside. Nice run pressure by Coach Chinander and UCF to create a TFL. The usage of the boundary safety in the pressure creates numbers where the offense did not expect them. The Clemson defense is spaced in a 3-4 defense with the ILB's stacked and a 2 high safety shell. 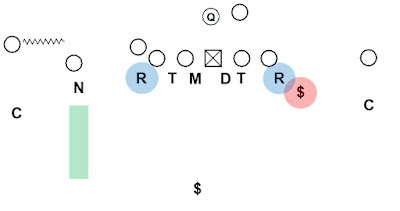 By stacking the ILB's Clemson can get both backers quickly to the side of the option. When the LBs are aligned in a traditional 3-4 spacing the back side guard has a reasonable angle to zone up to the back side ILB. The block by the back side guard slows the pursuit and play side run fit of the backer even if the ILB sheds the block effectively. The same block is more difficult for the guard when the LB is in the stacked alignment. The ILB is flowing play side too quickly and the angle for the guard is too extreme for the block to be effective. The stacked backers helps even the numbers for the defense. 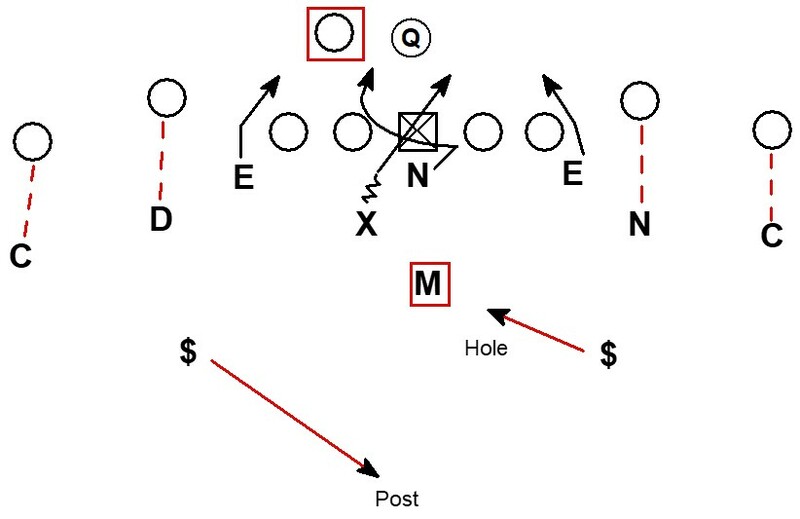 In this case the offense is presenting 6 blockers and can option a 7th defender on a dual option play. The defense now has 7 defenders. 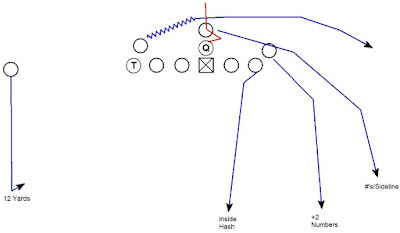 If the defense lost the extra LB (cut off by the back side guard for example), the offense would be advantaged with 6 blockers for 6 defenders and the ability to option one of the defenders. Georgia Tech is blocking for 6 defenders and optioning the 7th (Sam). The QB is keeping or pitching off the Sam backer's reaction. This is where the perimeter support comes into play. The defense has choices of who will be the pitch player on the option. The Safety, Corner, or OLB could all fill that role. In this diagram the support is a safety support (Safety playing pitch). 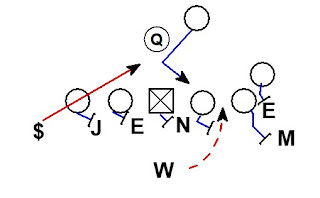 On paper the offense has good angles to get the defense blocked. In this diagram the support is a corner support. Again the offense has good angles to block the support players. 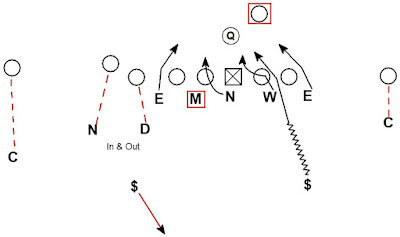 In this clip the Georgia defense stems to a stacked backer alignment pre-snap and plays a corner support. The OLB plays the QB, when the ball is pitched. GT's edge blocking has the Corner (pitch player) blocked with the arcing slot. 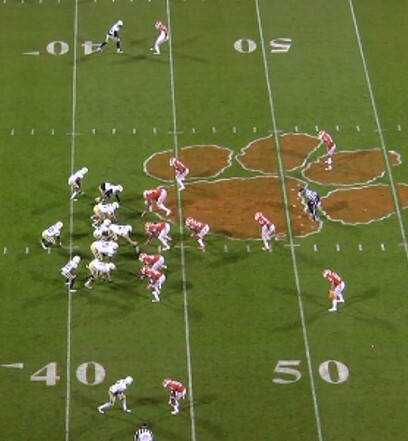 Clemson elected to play Backer support instead. 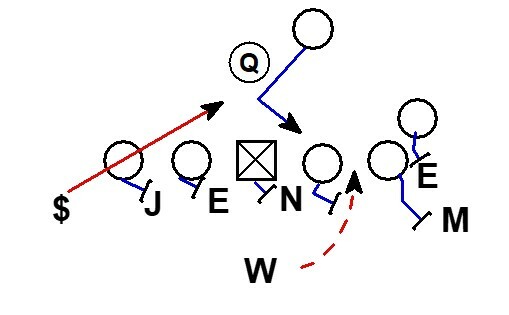 The OLB plays laterally for the pitch while the Safety fits inside in the alley. The arc block of the slot makes the angle to block the safety difficult. By changing up the support, Clemson has the advantage on the edge. Clemson played multiple fronts and supports in the game to keep GT off balance. Good stuff from Coach Venables and the Tigers. 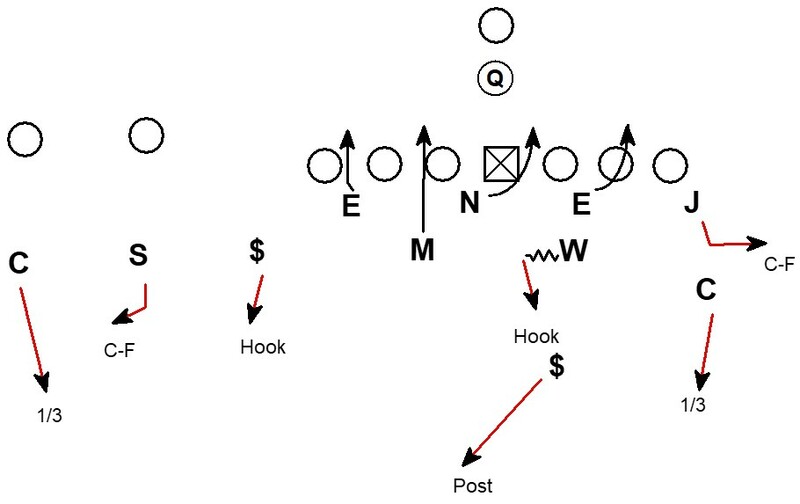 A couple of examples of play action pass (PAP) from the Navy offense. 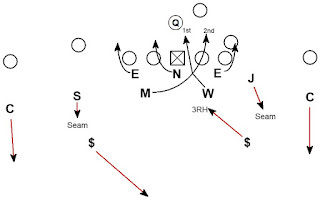 Navy is using a double slot formation with the WR snugged down with tight splits. The slot to the side of the action does a nice job selling a seal block on the LB before running his crossing route. 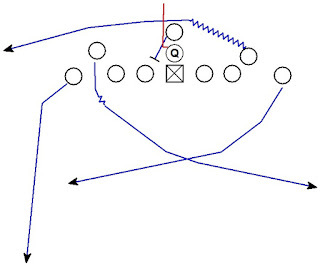 This route is designed to attack coverage rotation with the option action. 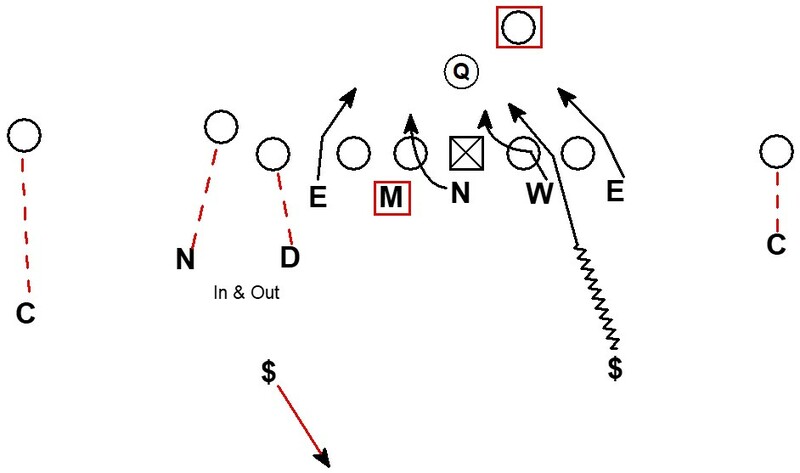 The back side rotation safety is in a bind with both an action side vertical threat and the delaying slot on the crossing route. 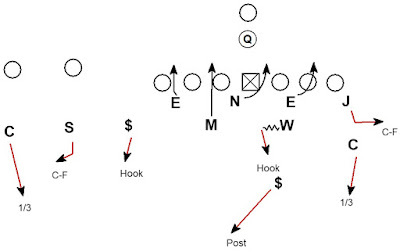 The next route is from a tackle over unbalanced formation. The route ends up a 4 receiver release to the weak side. The route concept spaces well to stress the coverage. The QB does a good job off the play fake of setting up in the pocket created by the unbalanced OL. 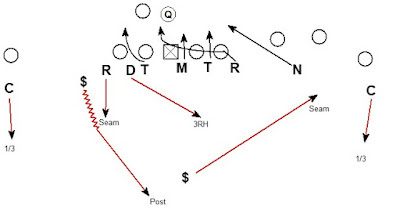 Unbalanced formation tend to heavy run, this play is a reminder flexbone teams do have PAP from the unbalanced formations. 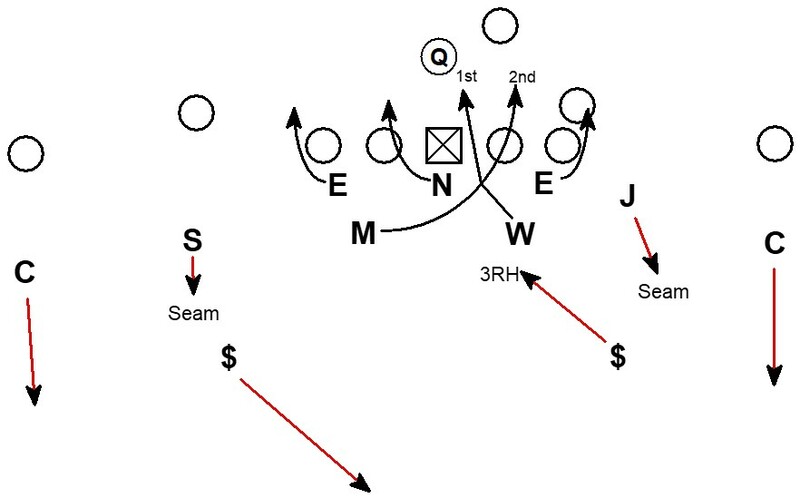 These are well designed concepts from the Navy offense and ones be aware of if you are defending a flexbone team next season. 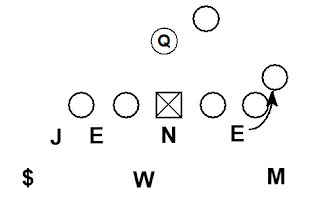 Texas running a classic cross fire pattern from an odd front 3-4 personnel. The first blitzer does a great job getting penetration and the second blitzer has an excellent ricochet redirect off the OT's block. The blitzers do a great job of attacking the OG and OT which allows Texas to beat a 7 man full slide protection with a 5 man zone dog. Great pressure from the Longhorns.